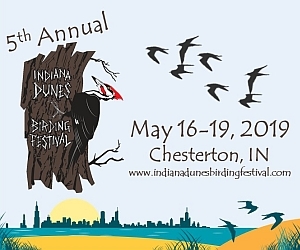 5 years ago we would have never imagined that we'd have over 1.2 million birds cataloged and new insights into the migration along the Indiana Dunes that we have today. The migration along the shores of Lake Michigan is a wondrous event that as we learn more, more questions come up. When we first started … Continue reading Season 2017 Start! It's hard to write about the longshore flight after a spectacular day like Monday. By Monday night the winds were howling. Weather vanes swung hard from south to north by midnight and Tuesday brought bone chilling cold on the lakefront. The breaking shelf ice literally built a brand new white cap of ice mounds behind … Continue reading More Flights and Lights. Today, March 30, 2014 was the day we were waiting all month for! Ken Brock, in his IN-Bird list-serv post said it best, "It was the kind of day one would like to bottle up and uncork next winter when the weather is dark and dismal." The day would end with the single best count … Continue reading The Lion’s Lamb!